The Paul G. Duke Academy for Community Leadership is a series of workshops designed to develop more effective directors, leaders, board members, staff and volunteers of nonprofit organizations. 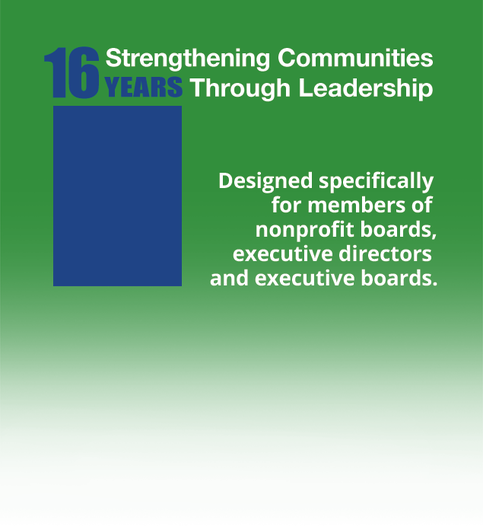 Course topics include the fundamental practices of board recruitment, planning, staffing, budgeting, evaluation, board meetings and community awareness. The classes are designed to help individuals make a difference on their boards and in their community. The Paul G. Duke Academy for Community Leadership is held annually for five (5) monthly sessions beginning in January and ending in May with the Mosaic Conference. The Paul G. Duke Academy for Community Leadership application form and scholarship information and criteria will be posted when they become available. The Paul G. Duke Academy for Community Leadership Mentor Program provides an opportunity to work and learn together! Mentoring can be a rewarding experience for both the mentor and the mentee. Mentorships provide the opportunity for feedback, reflection, evaluation and celebration of success. A mentor should ask his or her mentee about what the mentee’s individual and organizational goals are and what they are looking for from the mentoring relationship. Mentees should be clear about what they hope to receive from the mentoring relationship, particularly with respect to individual and organizational goals. These discussions early in the relationship will form the foundation of the work and learning together. Mentoring will start officially at the Mosaic of Community Leadership Conference upon graduation of The Paul G. Duke Academy for Community Leadership and conclude at the conference the following year. Both the mentor and mentee will be asked to evaluate their experience with the mentoring program. Often mentoring relationships informally continue for many years! ​Purpose To provide a tool for self-evaluation of your nonprofit board and a planning tool that can be used throughout the year for ensuring that the work of the board and organization gets completed. This instrument defines specific steps and actions that can be taken by the board to meet organizational goals. All Stakeholders will play a major role in achieving this award. Recognition Recognizing that outstanding communities are characterized by quality life supported by individuals committed to service and stewardship in the nonprofit sector—The Edison State Community College Center for Leadership Development created this award to recognize nonprofit boards who are doing outstanding work in the region. This checklist document is to be submitted to Edison State Community College Center for Leadership Development by April 10.